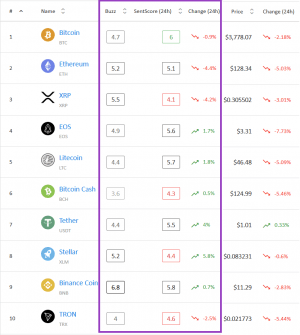 Despite the crypto market is in red today, six of the top 10 coins by market capitalization maintain a positive market sentiment. Nevertheless, the other four currencies are in the negative sentiment area, according to crypto market sentiment analysis service Predicoin. The average market sentiment score today is 5.11, lesser compared with the one last week (5.58). 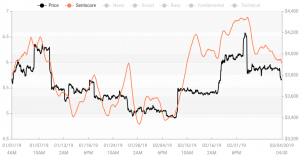 However, the overall hype has been growing over the past 24 hours, and the sentiment appears to be gradually recovering. Bitcoin kept the highest sentiment score, followed by Binance Coin, Litecoin, and EOS. The currencies that are in the negative area are XRP, Bitcoin Cash, Tron, and Stellar. 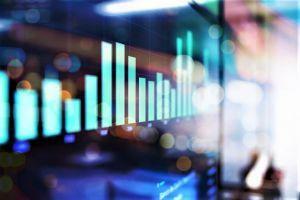 The sentiment surrounding all coins was decreasing last week, which reflects in the recent sell-off. In the past seven days, Bitcoin has dropped the least (-0.9%), followed by XRP (-4.2%), Ether (-4.4%), Binance Coin (-4.7%) and Litecoin (-5%) of their total sentiment score. 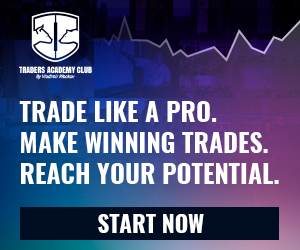 Among the biggest losers are Bitcoin Cash (-10.7%), EOS (-8.5%), Tether (-6.8%), Tron (-6.4%), and Stellar (-5.8%). As such, none of the coins experienced a positive sentiment increase compared with last Monday. Even so, most coins are already showing signs of recovery, as their last 24-hour sentiment is turning positive. Stellar leads the way (+5.8% increase), followed by stablecoin Tether (+4%). On the negative side of the equation is Ethereum, which has finally activated the Constantinople upgrade last week, and XRP, which did not experience a significant pump after its much anticipated Coinbase and Coinbase Pro listings. Binance Coin, Ripple, Stellar, and Ethereum generate the most social buzz heading further into the week. All in all, the majority of the most popular coins still carry a positive market sentiment, although the general trend is heading towards neutral. Yet, there are signs of possible recovery in the past 24 hours, so it remains to be seen what this spring will bring for the crypto market. When registering on Predicoin, use a coupon code CRYPTONEWS to get a 25% discount. Next story Will Samsung's Crypto Drive Topple Google & Co's Internet Empire?